This oyster shucker makes a tough job easier and it gives back to the ocean, too. The stainless steel blade extends fully into the handle for boosted durability and has a bent tip that provides the perfect pivot point to crack open the shell. An ergonomic thumb print on the sturdy recycled plastic handle gives you a firmer grip. 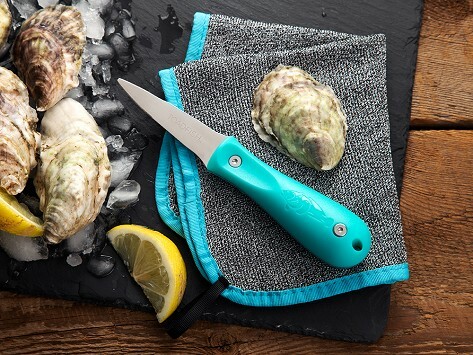 Pair with the optional cut-resistant shucking cloth, and you'll be ready for an oyster feast.